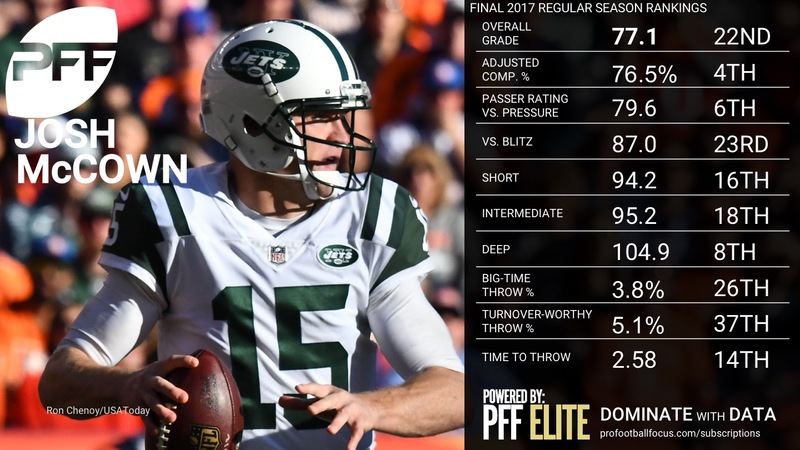 All season long, PFF Analysts Steve Palazzolo and Zac Robinson gave you an overview of every team’s quarterback, and where they ranked in terms of overall PFF grade as well as detailed notes on a select few who stood out for good, or bad, every week. These rankings were based on their overall grades after each week, and can always be found as a part of the PFF Edge subscription. 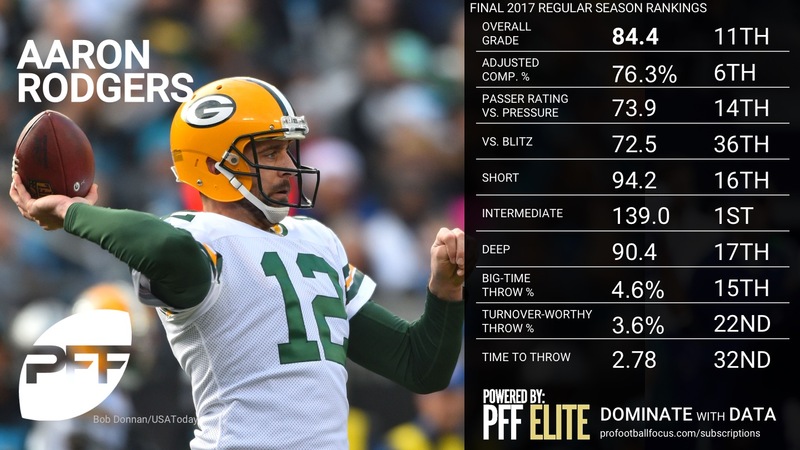 With the regular season gone and a wild, wild-card round in the books, we have completed our analysis on the 17 weeks of the regular season of the 2017 NFL season, and have our official, final NFL QB rankings by PFF Player Grades. 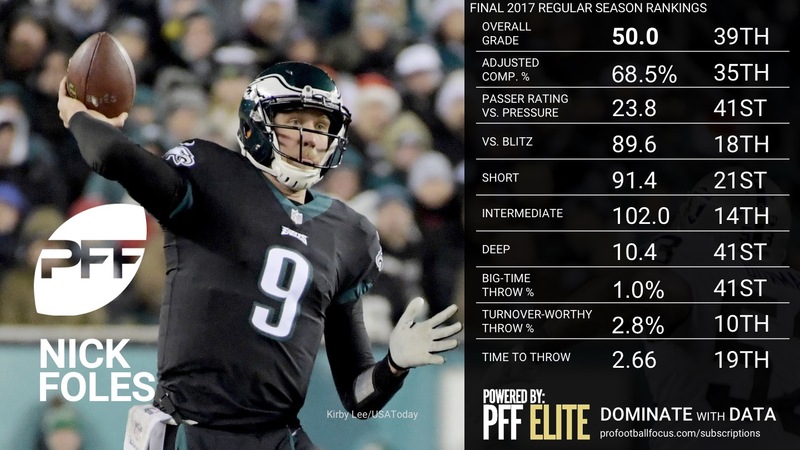 Coinciding with each quarterback, is a sample of the brand new PFF Quarterback Annual, which contains a bevy of need-to-know information on every quarterback who played significant snaps this season, available to PFF Edge and Elite subscribers. Excerpt from the PFF QB Annual: Brady led the league in total big-time throws while finishing third at 6.2 percent. He continued his trend of hitting on a number of deep passes while showing his usual pinpoint ball location on seam routes. Brady also racks up the big-time throws in the red zone where the windows are tighter and he’s able to throw passes away from defenders in close coverage to give his receivers touchdown opportunities. Excerpt from the PFF QB Annual: Ryan’s 89.8 overall grade is just 2.8 points down from last year’s mark and actually higher than the three previous seasons before that. 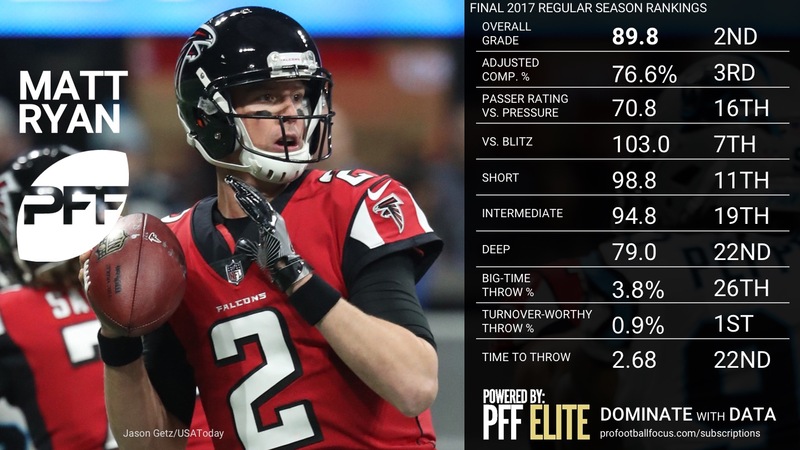 After a slow first month of the season, Ryan definitely found his groove in 2017 and went through the rest of the year on something of a tear, with the only hiccup coming against the Saints the first time the two teams played. 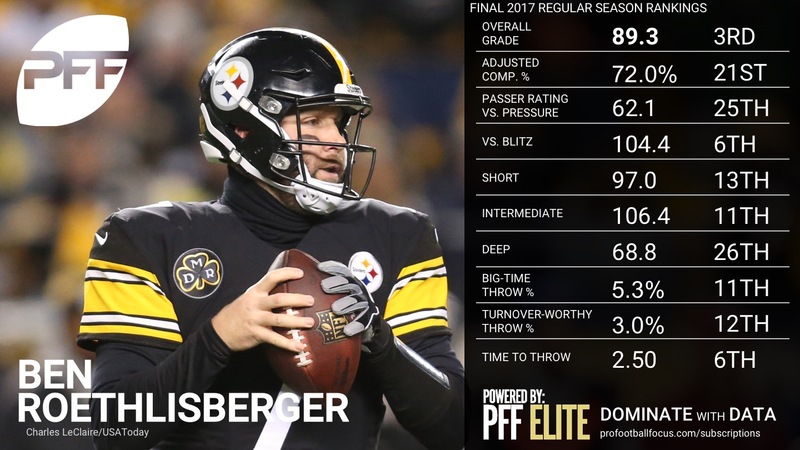 Excerpt from the PFF QB Annual: It took awhile for the Pittsburgh Steelers’ offense to realize the potential they had, but over the second half of the year, there was no better signal-caller than Ben Roethlisberger. He was able to excel throwing to multiple receivers and man the helm of one of the most explosive offenses in the game. 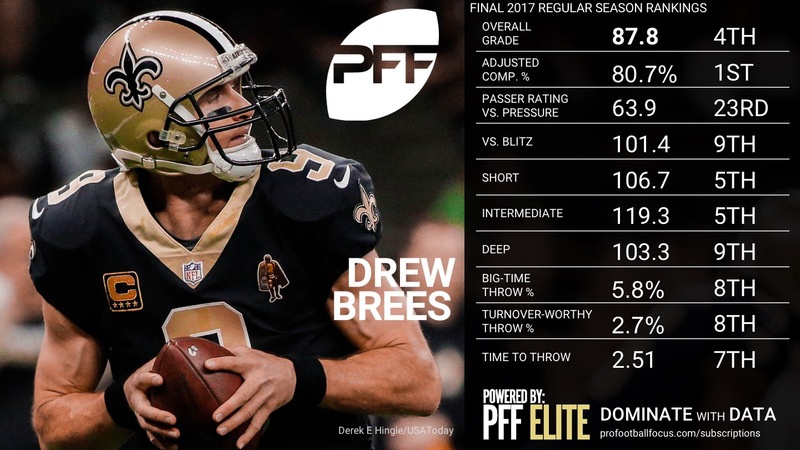 Excerpt from the PFF QB Annual: Brees finished with an overall grade of 88.4, marking the second straight year he has dipped below his previous baseline of 90.6, but even that dip saw Brees finish as a top-5 quarterback. However, the Saints more than made up for Brees’ slight decline by improving dramatically around him, with running backs Mark Ingram and rookie Alvin Kamara combined to form a formidable duo. 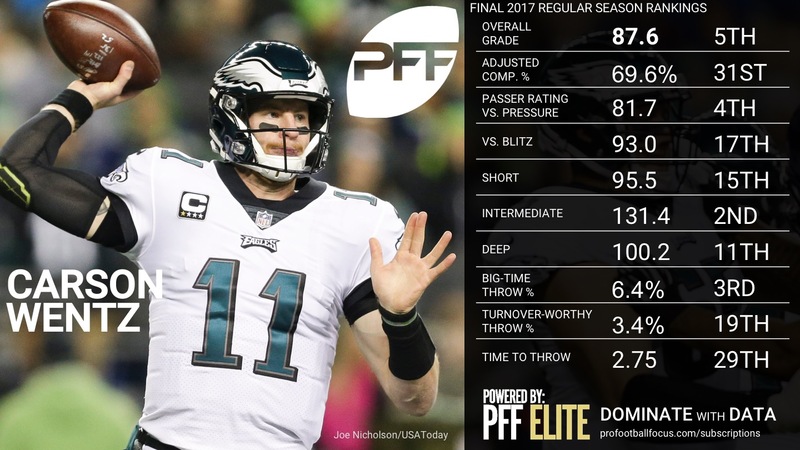 Excerpt from the PFF QB Annual: The way he played outside the first month of his rookie season would have left many Eagles’ fans a little nervous about Carson Wentz heading into his second season, but the growth and development he displayed before injury was remarkable. 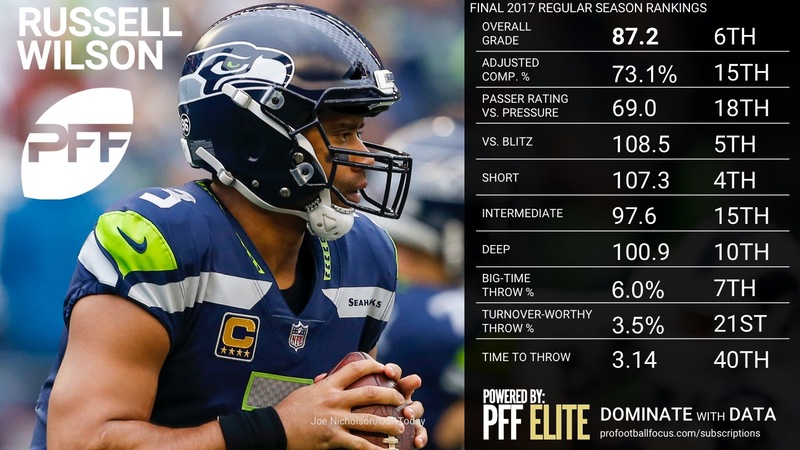 Excerpt from the PFF QB Annual: As has typically been the case, Russell Wilson’s season was one of highs and lows. At his best, there is no better quarterback in football, but he also has multiple ugly games a season and typically at least one disaster – 2017 was no different. 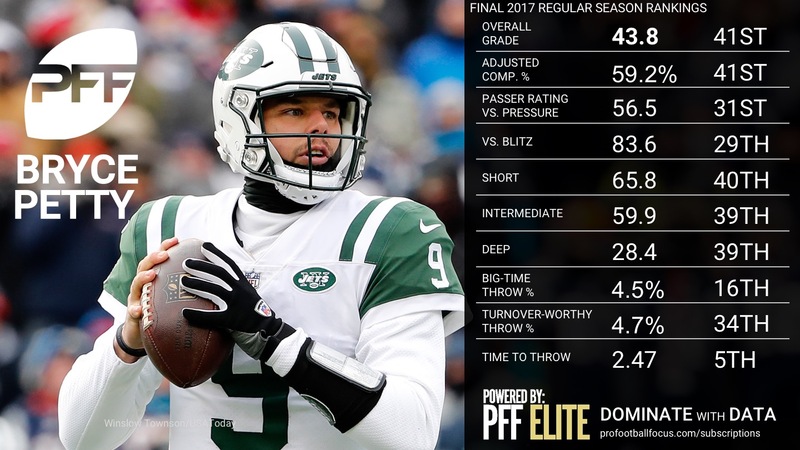 Excerpt from the PFF QB Annual: One of the biggest stories of the 2017 season, Smith became a big-time throw machine, posting the highest percentage of his career and ranking fifth in the league at 6.04 percent. There were more schemed-up opportunities for those big plays, but it was a different feel to Smith’s game this season as he took chances into tighter windows and the aggressiveness paid off. Excerpt from the PFF QB Annual: The entire 2004 class of quarterbacks had been trending the wrong way heading into 2017 as they advance in age, but Philip Rivers halted his decline this year and posted his best overall grade since 2014. Rivers and his Los Angeles Chargers ultimately came up one game short of the playoffs, but over the final seven weeks of the season, the only quarterback to post a higher grade was Pittsburgh Steelers quarterback Ben Roethlisberger. 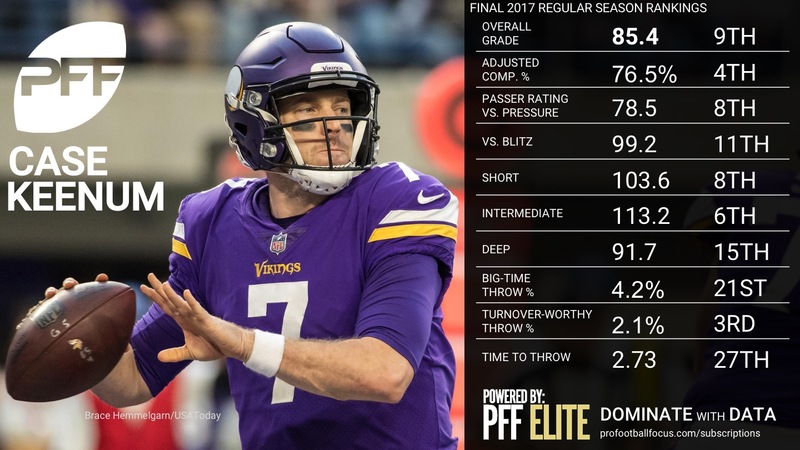 Excerpt from the PFF QB Annual: Keenum’s incredible run this season with the Vikings extended all the way into the red zone this season. He threw the highest percentage of catchable passes of any starter in that area (76.9 percent) and didn’t have a single turnover-worthy throw. That’s more than just game managing. 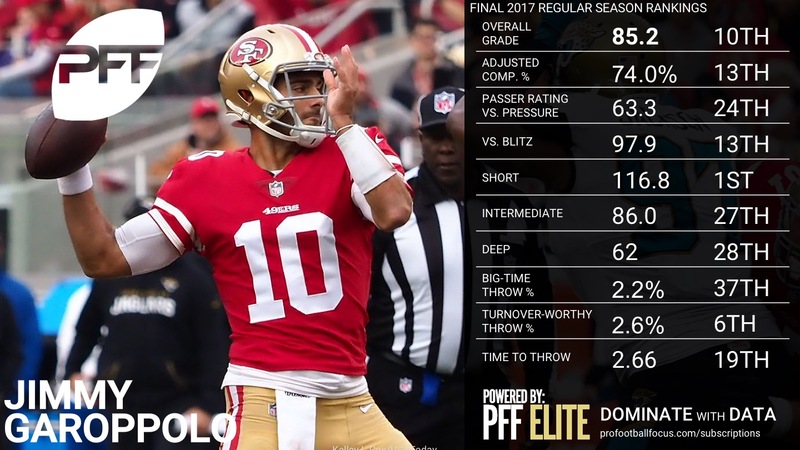 Excerpt from the PFF QB Annual: Garoppolo didn’t get on the field for the 49ers until Week 12, with Kyle Shanahan’s offense notoriously difficult to learn and master quickly, but once he did, he looked like a star. He took over a team that had won just one game to that point and guided them to five straight victories to end the year, including wins over three playoff-bound teams. 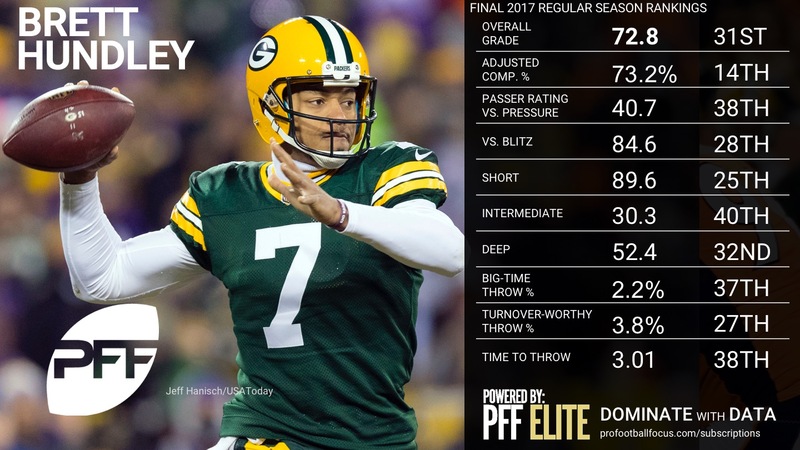 Excerpt from the PFF QB Annual: A rough start to the season was in the process of being put right until Aaron Rodgers ran up against the Minnesota Vikings in Week 6 this season. After just four passing plays, Rodgers was hit and taken to the ground by Vikings linebacker Anthony Barr in a shot that would break his collarbone and land him on the shelf, in a race to be healthy again and able to return while the Packers were still in playoff contention. 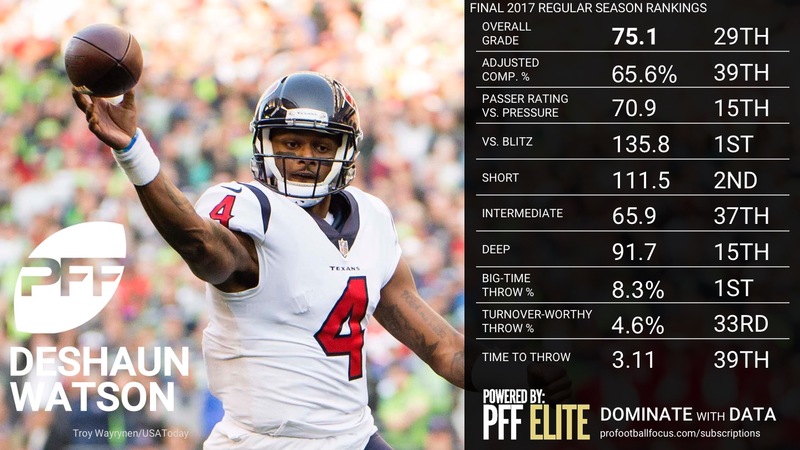 Excerpt from the PFF QB Annual: Taylor finished 2017 among the league’s most accurate passers under pressure. His 53.5 completion percentage was fifth among starters and his 79.4 passer rating was seventh, but the one area he struggled through in 2017, was taking sacks. Taylor converted pressure to sacks 23.3 percent of the time – the highest rate in the NFL. 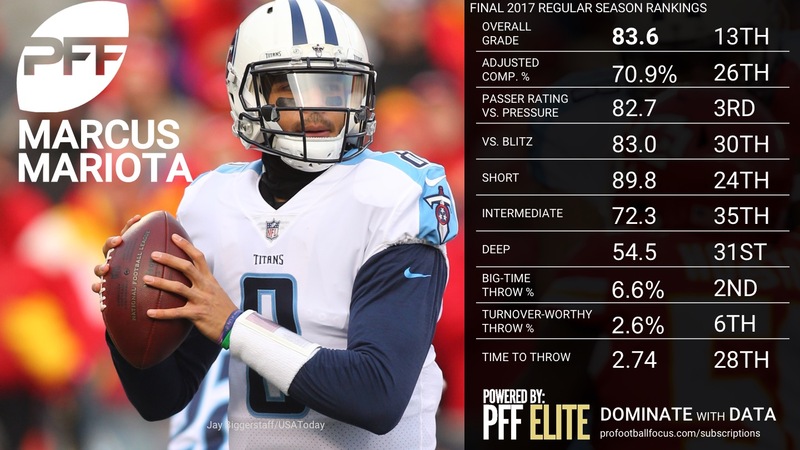 Excerpt from the PFF QB Annual: It may be surprising to see how high Mariota ranked in big-time throws, but he had the second-highest percentage in the league and tied for fourth overall. He hit a number of two-level throws around zone coverage and tight-window throws away from tight man coverage. However, he tied for second in the league with five of his big-time throws falling incomplete on the year. 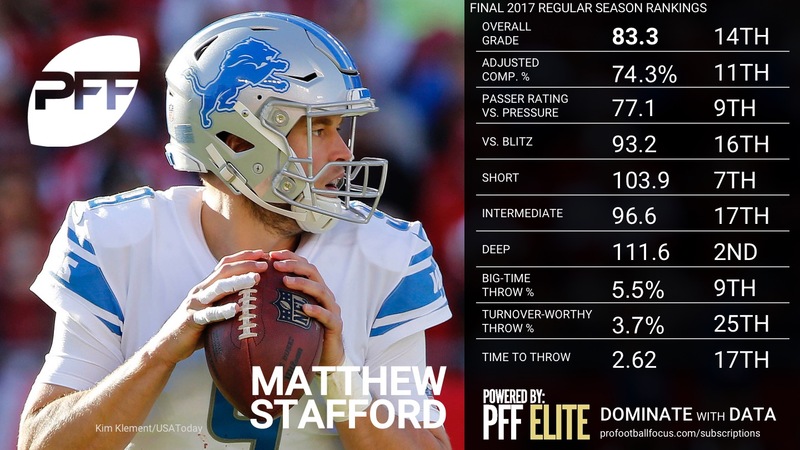 Excerpt from the PFF QB Annual: Stafford ended the campaign with an overall PFF grade of 83.3 – down from 85.9 a season ago – but it was a year of highs and lows, with the Lions’ fortunes typically resting on his performance. Stafford had six games this season with a PFF grade above 80.0, but he also had five that were 55.0 or worse and three that were below 50.0, bouncing all over the map in terms of performance and output. 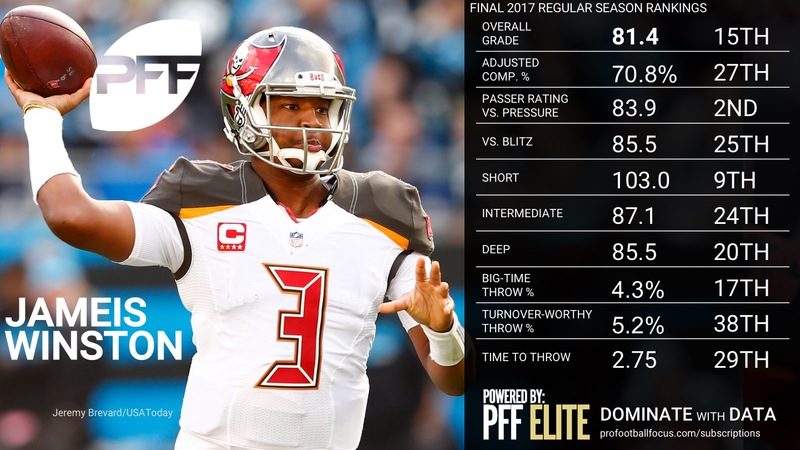 Excerpt from the PFF QB Annual: A vertical passing offense gives Winston plenty of opportunities to make plays down the field and his anticipation makes him dangerous on seam, post and corner routes. He finished 16th in big-time throw percentage at 4.51 percent while also ranking second in overall positive grade percentage, showing just how much value he can bring to an offense. 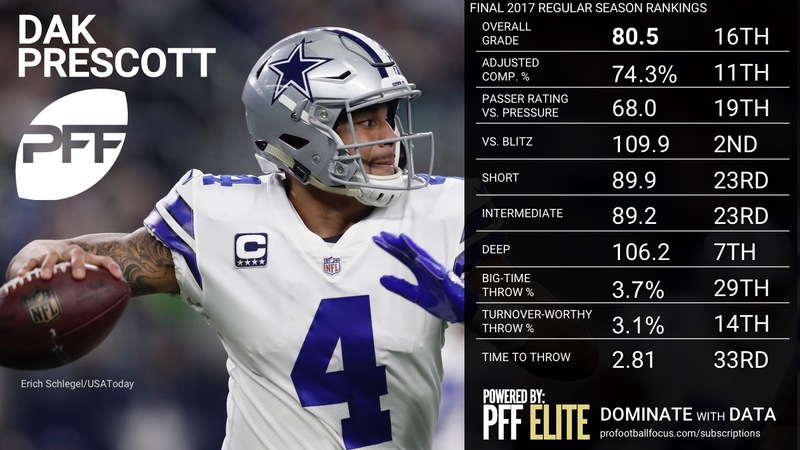 Excerpt from the PFF QB Annual: For the second straight year, Prescott ranked in the bottom three in deep passing attempt percentage, yet he finished 15th in adjusted completion percentage last season and improved to fifth in 2017, including the 12th-highest grade on those throws. Whether it’s a conservative quarterback or a restrictive scheme, a few more deep shots should be in order for Prescott in the coming years. 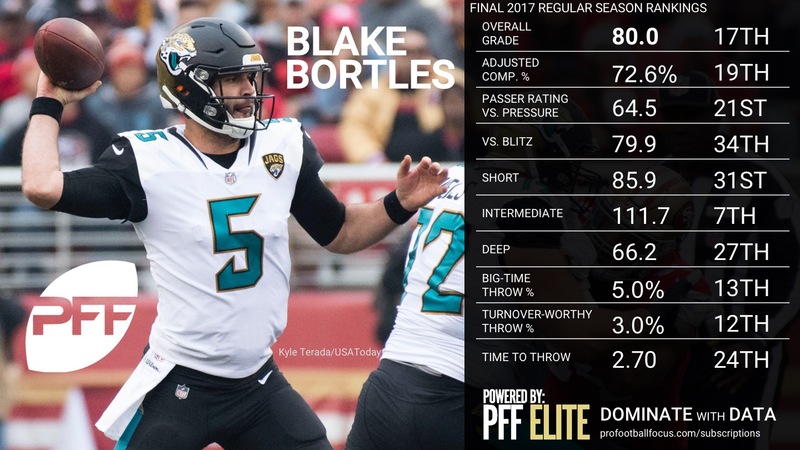 Excerpt from the PFF QB Annual: Bortles showed excellent touch this season as he threw receivers open in zone coverage and led them away from man coverage, particularly in between the numbers, all leading to the 12th-highest percentage of big-time throws in the league at 5.04 percent. Excerpt from the PFF QB Annual: There is no hiding the giant leap forward taken by Jared Goff in his sophomore campaign under new head coach Sean McVay. 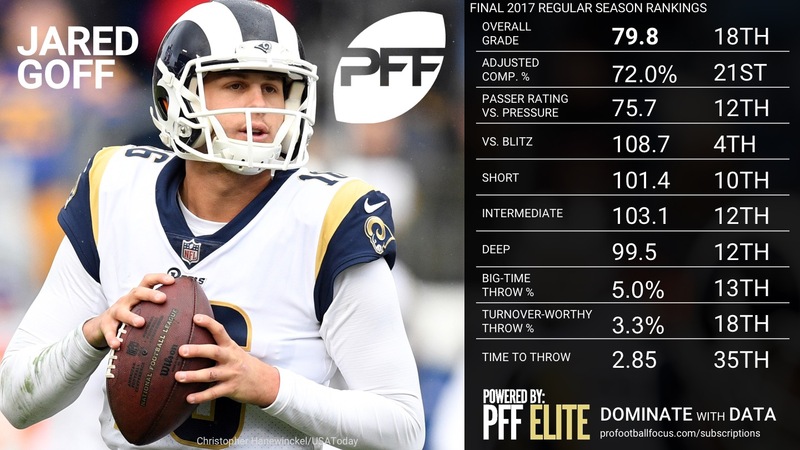 Goff’s overall PFF grade improved from a disastrous 45.6 as a rookie to 79.8 this season, an increase of more than 30.0 points. His best games this season were excellent, and he manned the helm of one of the league’s best offenses, but there were still poor outings that he will hope to eradicate in 2018 and beyond. 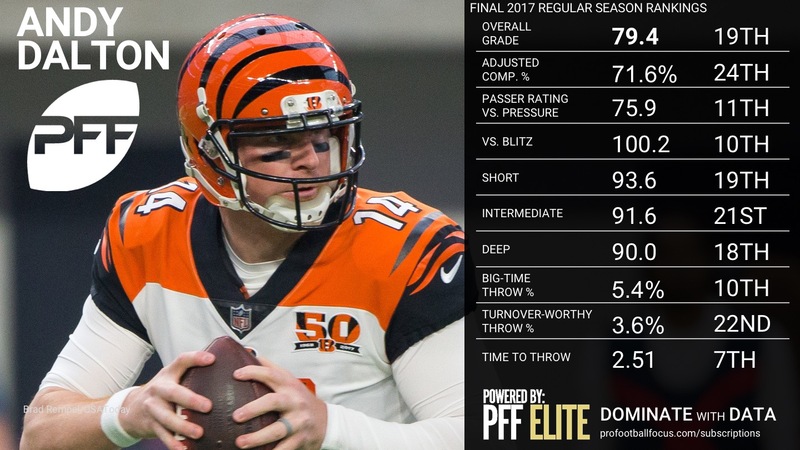 Excerpt from the PFF QB Annual: One of the better ‘seam’ throwers in the NFL, Dalton throws with anticipation, touch, and accuracy in between the numbers where he picked up 54 percent of his big-time throws. The same skill led to six big-time red zone throws, tied for most in the league. 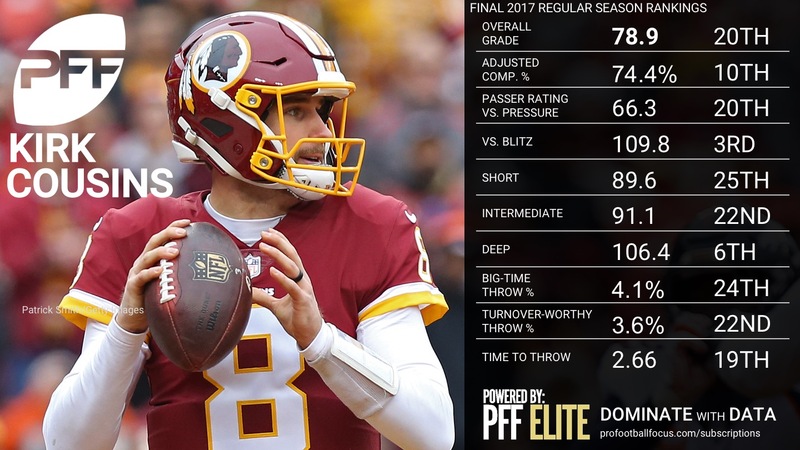 Excerpt from the PFF QB Annual: If 2017 was the final audition for Kirk Cousins to earn himself a blockbuster contract with the Washington Redskins, he didn’t exactly knock it out of the park. His 78.9 overall grade was the worst he has posted over the last three years, and his season was bookended by the worst two games of the year. 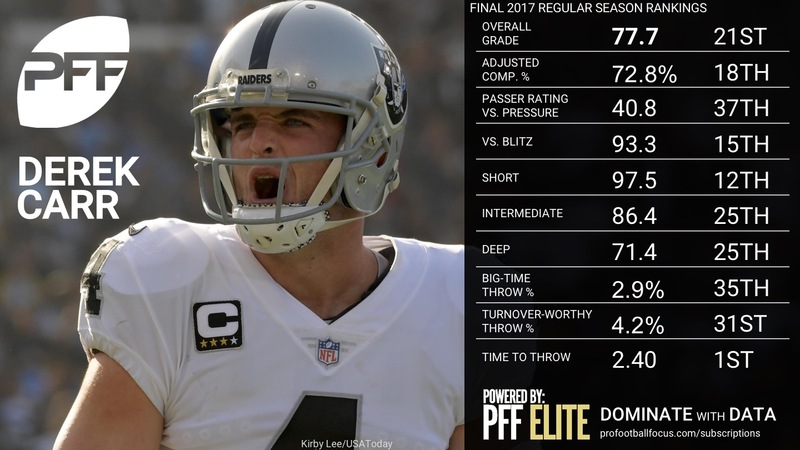 Excerpt from the PFF QB Annual: Carr is superb about getting the ball out of his hands quickly against the blitz, but it didn’t always lead to ideal results. He had the lowest percent of his blitzed dropbacks lead to pressure (29.0 percent), but also had the lowest rate of big-time throws against the blitz (0.9 percent). Carr’s average time to throw when blitzed was a swift 2.16 seconds – the fastest among starters. 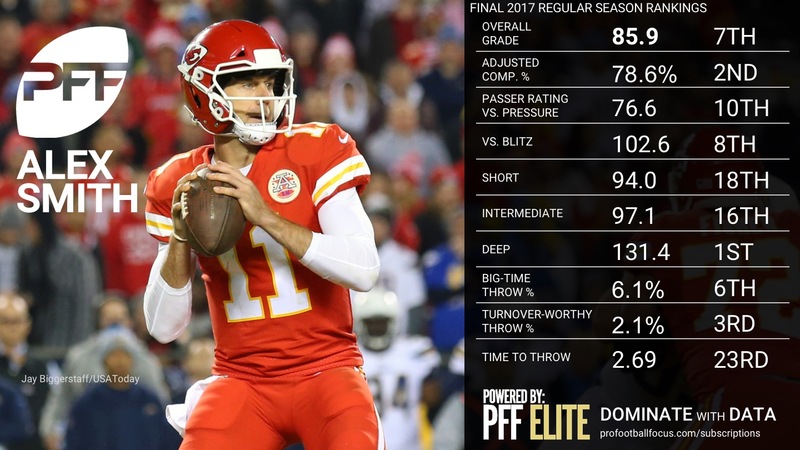 Excerpt from the PFF QB Annual: The 2017 season was riddled with career years throughout the NFL, in particular among veteran quarterbacks. The Jets were among the favorites on paper heading into the season for the No. 1 overall pick in 2018, but they ended up a significantly more competitive outfit than those expectations. Josh McCown at quarterback was a big reason for that, and his 77.1 overall grade was the best mark we have seen from him outside of his 2013 season with the Chicago Bears that lasted just eight games. 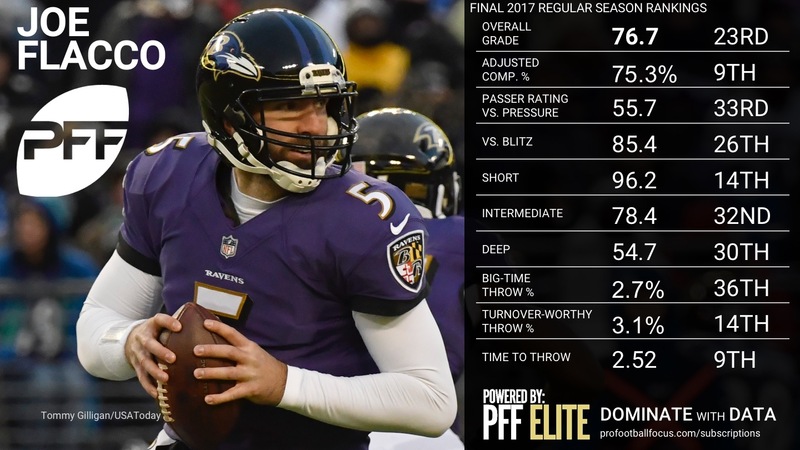 Excerpt from the PFF QB Annual: Despite his reputation as a big-armed deep-ball thrower, Flacco has posted an adjusted completion percentage of over 40.0 percent just twice since 2010. In 2017, he finished 24th among 35 qualifiers at 37.0 percent, his third straight year under 40.0. Only 8.4 percent of Flacco’s attempts were deep balls, lowest in the league, so there’s a lack of trust in his receivers or simply scheme limitations holding him back. 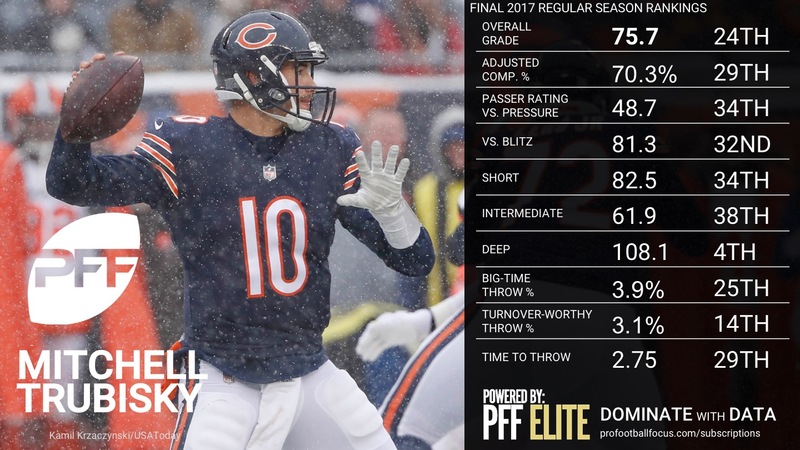 Excerpt from the PFF QB Annual: For much of the year, Trubisky was asked to simply manage games and rarely attempt anything difficult or complex, but later in the season, the offense was opened up a little, and he was allowed to play more expansively. Broadly speaking, that approach worked, though not without low moments. Against the Lions in Week 15, he threw three interceptions, and some of those passes were horrendous mistakes, but the bigger picture definitely showed a new potential that had been hidden by the conservative game plans earlier in the season. Excerpt from the PFF QB Annual: The 2017 season saw the end of Carson Palmer’s lengthy career, as he elected to retire after the end of the year in Arizona, one in which injury shut him down after Week 7. With the Cardinals again having a porous offensive line in front of him, Palmer continued the decline from his MVP-caliber 2015 season and he ended with an overall PFF grade of just 75.6, his worst since 2009. 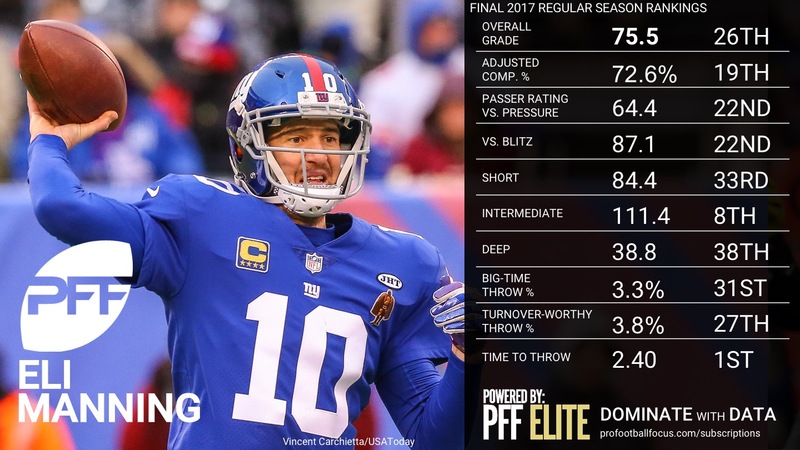 Excerpt from the PFF QB Annual: Eli Manning found himself in the eye of the storm that was the New York Giants 2017 season, with the team at 2-9, New York’s brass decided to bench him to get a look at the other quarterbacks on the roster over the final games of the season, ending the longest active start streak in the league in the process. Manning’s play had been declining over the past few years, but he had actually ticked upwards to that point despite losing every wide receiver to injury at one point or another. Manning was re-inserted into the lineup after Ben McAdoo was fired and ended the year with an overall PFF grade of 75.5, five grade points higher than last year. 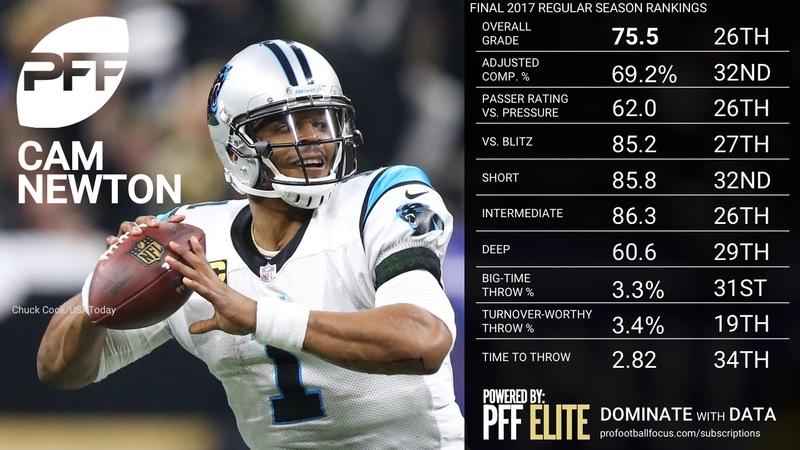 Excerpt from the PFF QB Annual: In 2015, Newton ranked eighth in adjusted completion percentage on deep passes at 46.6 percent, but that number dropped to 33.8 percent (28th) in 2016 and 35.1 percent (27th) in 2017. A bigger concern is Newton’s work in the intermediate level, where he ranked 34th out of 38 qualifiers in PFF grade this season and on short passes where his passer rating of 75.4 ranked 28th, despite the emphasis on making life easier for him with the quick game. 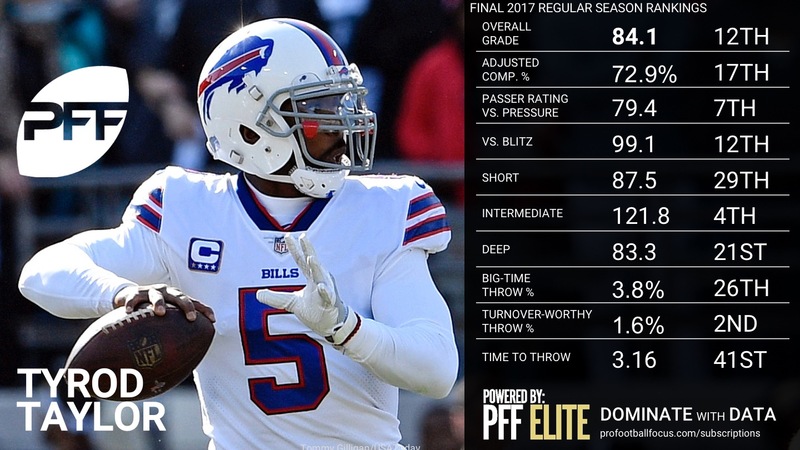 Excerpt from the PFF QB Annual: Despite rarely throwing the deep ball, Brissett finished ninth in adjusted completion percentage at 43.9 percent and his passer rating of 107.0 ranked fourth. 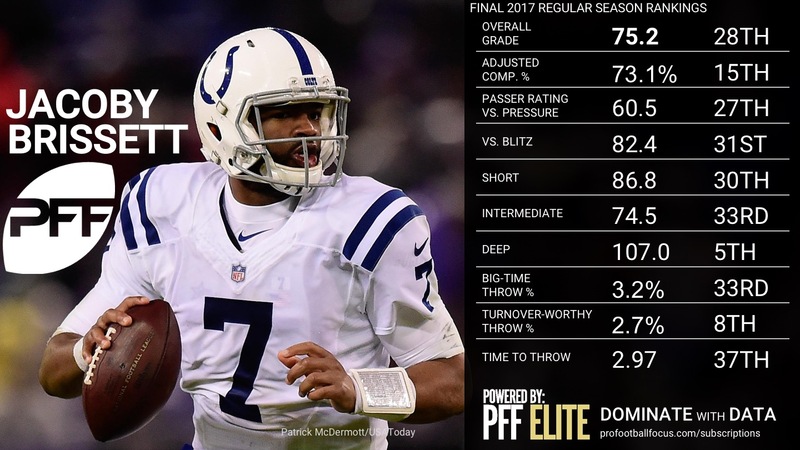 He was solid in the short game, ranking 16th in PFF grades, but there’s room to improve at the intermediate level where Brissett finished 30th in PFF grade and his passer rating of 77.1 ranked 31st in the league. Excerpt from the PFF QB Annual: Injury robbed us of one of the most interesting rookie years in recent memory. Watson came in to take over for Tom Savage just 31 snaps into the Week 1 game against Jacksonville and transformed the Texans’ offense. He didn’t play well in that first game but improved in the subsequent weeks as the starter and completely changed the Houston offense from hopeless into a dangerous unit. By the time he went down hurt, he had thrown for 19 touchdowns and rushed for another two. Despite just seven games of play, that is a figure that still led players like Matt Ryan after the entire season. Excerpt from the PFF QB Annual: After his performance starting for the Jets last year, the best Ryan Fitzpatrick could do in free agency was a backup job, sitting behind Jameis Winston on the Tampa Bay Buccaneers’ bench. Injury, however, gave Fitzpatrick the opportunity to appear in six games, five of which he played significant snaps in, and three of which he started. 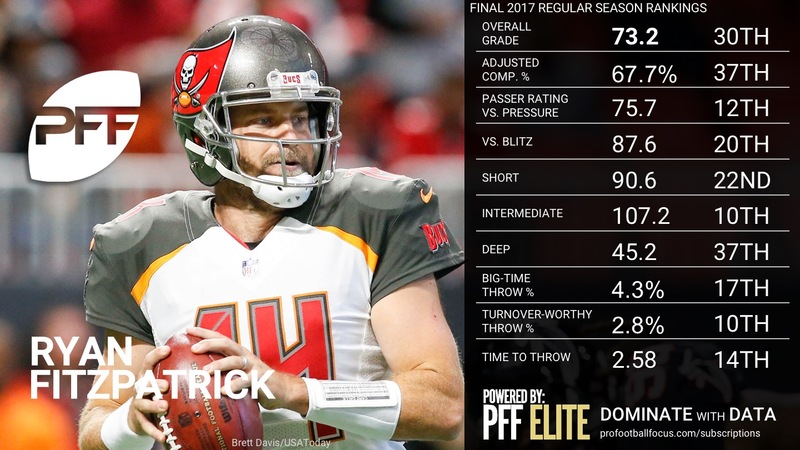 Fitzpatrick was OK in relief of Winston, and the Bucs won two of his three starts, accounting for 40 percent of the team’s wins over the year. Excerpt from the PFF QB Annual: Hundley ranked 39th out of 44 qualifiers in big-time throw percentage at 2.38 percent. All seven big-time throws were thrown outside the numbers and on some kind of ‘go’ route variation, including one well-placed back-shoulder throw in the end zone. Hundley showed that he can lay the ball out there on the deep ball against one-on-one coverage, but there’s a lot of room to improve when it comes to creating big plays over the middle of the field. 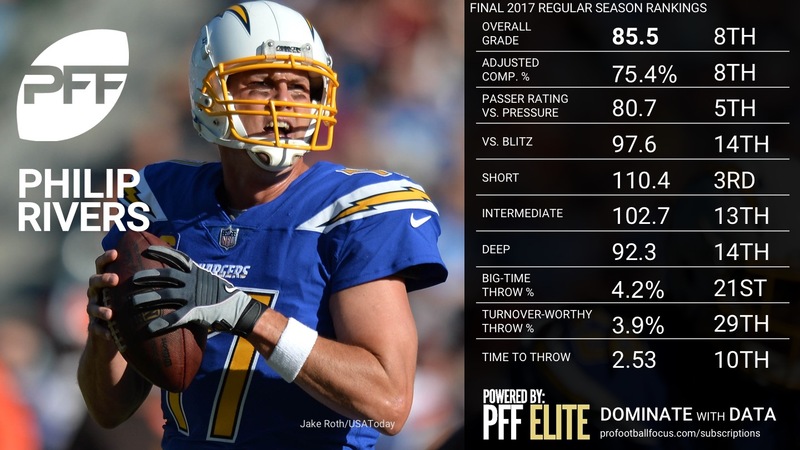 Excerpt from the PFF QB Annual: In addition to leading the league in big-time throw percentage at the intermediate level, Savage finished ninth in PFF grading at that level. His short game was rough, however, as he finished with the No. 37 PFF grade, and his results were similar on the deep ball where he finished 33rd in grading. 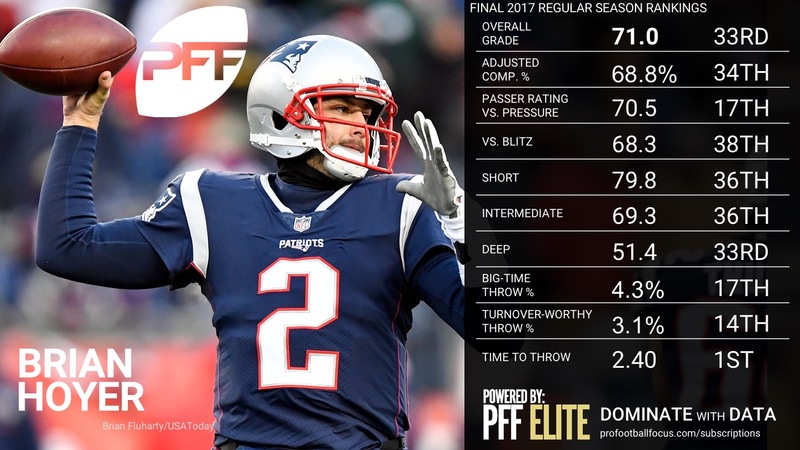 Excerpt from the PFF QB Annual: Hoyer experienced one of the more tumultuous seasons of any quarterback in the league, beginning the year as the starter for the San Francisco 49ers and ending it as Tom Brady’s backup in New England. He was poor over the first two games of the year before his one good game of the season, an 83.9 grade against the Rams in which the team still came up short thanks to the Rams racking up 41 points. Hoyer started three more games before being benched for rookie C.J. Beathard and wouldn’t get the job back, subsequently being released after the team traded for Jimmy Garoppolo, and ultimately replacing him in New England by signing back with the Patriots. Excerpt from the PFF QB Annual: Beathard started from Week 6 until Week 12, where he lost the job to Jimmy Garoppolo, whom the team acquired before the trade deadline and believed to be their new franchise quarterback. 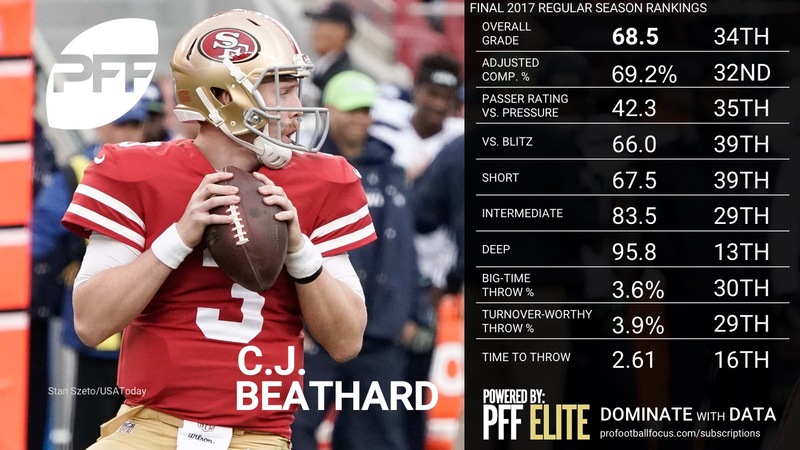 Beathard did little to suggest he could compete with that kind of potential, ending the season with an overall PFF grade of 68.5 and posting just one game grade above 70.0, an impressive display against the hapless New York Giants secondary in Week 10. Excerpt from the PFF QB Annual: Starting quarterback Ryan Tannehill went down for the year with torn knee ligaments in the first non-contact, full-team practice in August, three days later the team convinced Jay Cutler to come out of retirement to rescue their season and then Hurricane Irma postponded their first game of the year. 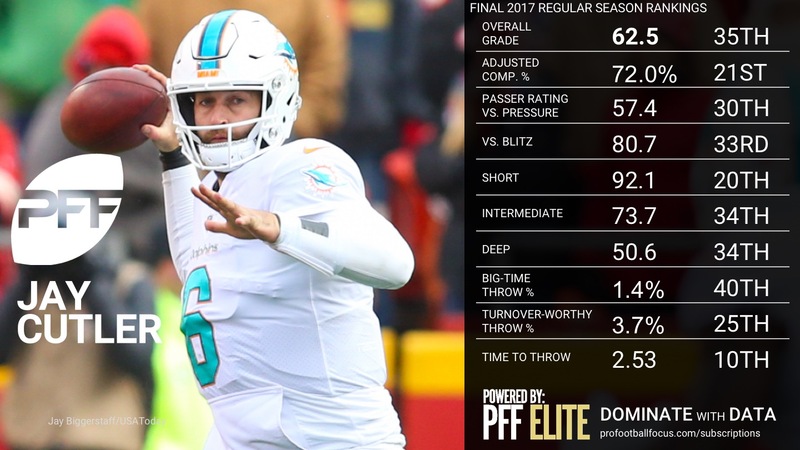 Cutler had the occasional high point over the year but overall looked largely like a quarterback that had planned to spend this season on the couch, or in the broadcast booth. Somehow, despite Cutler’s lackluster play, the Dolphins were in contention until relatively late in the season before a three-game losing streak ended their year on a sour note. 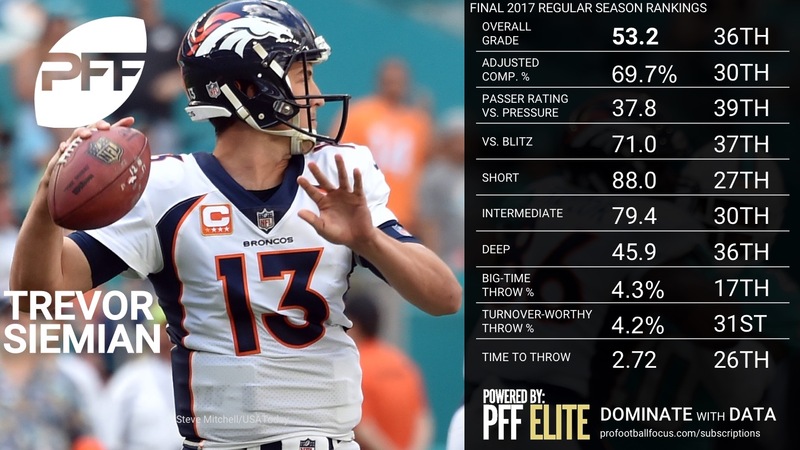 Excerpt from the PFF QB Annual: Trevor Siemian began the season with a PFF grade of 76.7 against the Chargers in Week 1, giving Denver the average quarterback play that they needed to contend, given their impressive defense and capable ground game. However, Siemian’s play collapsed over the remainder of the season, and the Broncos just couldn’t overcome that level of performance at the position. He ended the year with an overall grade of just 53.2, actually lower than a season ago. 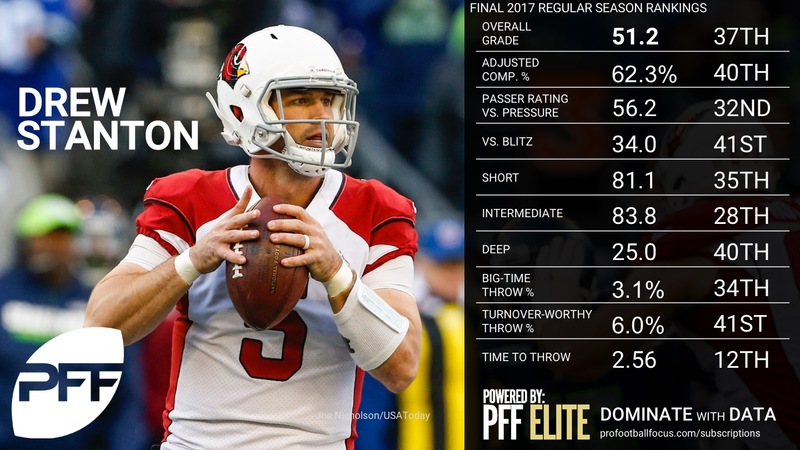 Excerpt from the PFF QB Annual: When Cardinals QB Carson Palmer went down for the year, Drew Stanton was next-man up as the long-time backup in the desert. Stanton came in for Palmer against the Rams in Week 7 and subsequently started the next two games before he was also lost to injury, opening the door for Blaine Gabbert to get some starts under his belt. Stanton returned to the lineup for the final two weeks of the season, but over the course of the year did little to earn positive grading, even if the Cardinals shocked the Seahawks and dumped them out of the playoff hunt with that final game. 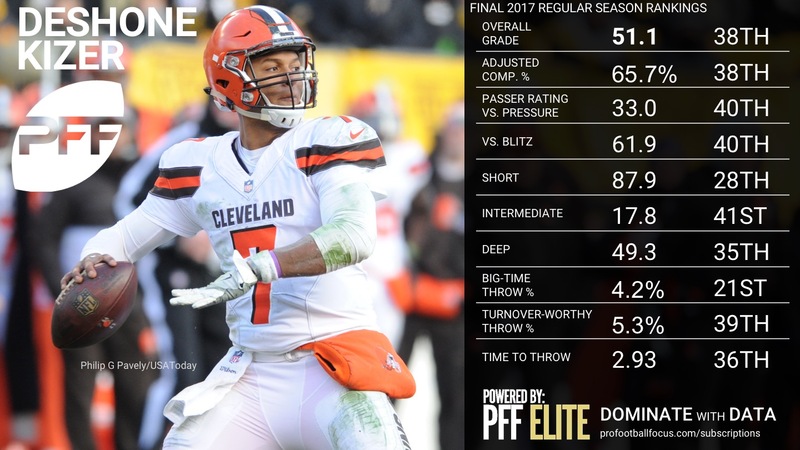 Excerpt from the PFF QB Annual: Kizer had nine games with a PFF game grade under 50.0, five games in the 30’s and could only flash his potential on a couple of occasions, with grades of 88.5 and 86.1 coming across two games against Cincinnati and Detroit. Overall, Kizer earned a grade of just 51.1 over the season, ranking 38th in the league, ahead of only Blaine Gabbert and Brock Osweiler. Excerpt from the PFF QB Annual: Both of Foles’ big-time throws came in his first start, as he moved off the spot to throw a well-placed deep ball that fell incomplete and hit WR Alshon Jeffery with a pinpoint throw in the back of the end zone for a touchdown. Overall, Foles had big-time throws on only 1.87 percent of his attempts, 43 out of 45 qualifiers in his limited sample size. 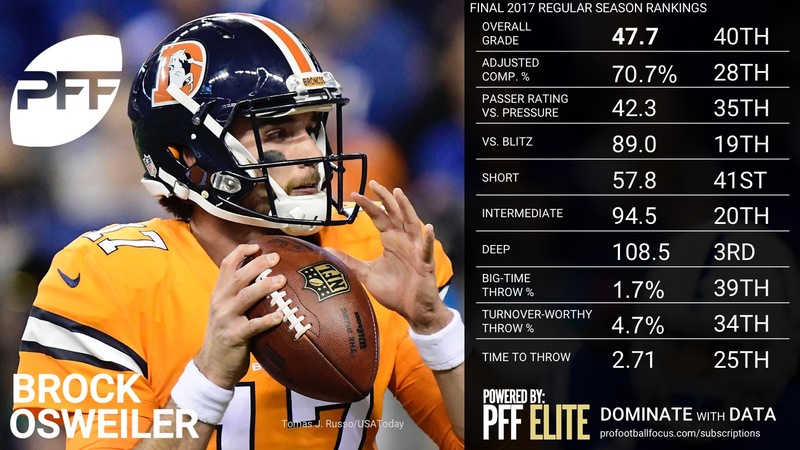 Excerpt from the PFF QB Annual: Osweiler found himself back in Denver, where he was thought to have belonged all along after stints in Houston and Cleveland. He did nothing in 2017 to prove that he did indeed belong at the helm of the Broncos, finishing with the league’s 39th-lowest grade among 40 qualified quarterbacks. 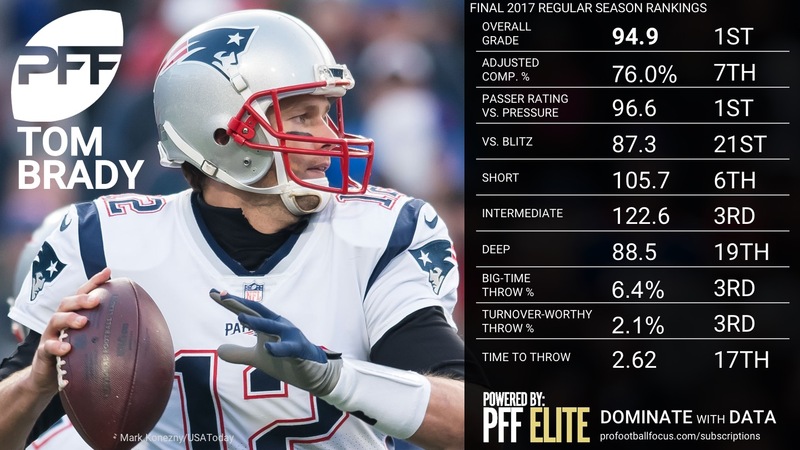 Excerpt from the PFF QB Annual: Petty ended up playing some part of the last four games of the season, starting the final three, and seeing his grade get progressively worse – bottoming out with a mark of 40.6 against the Patriots in Week 17. 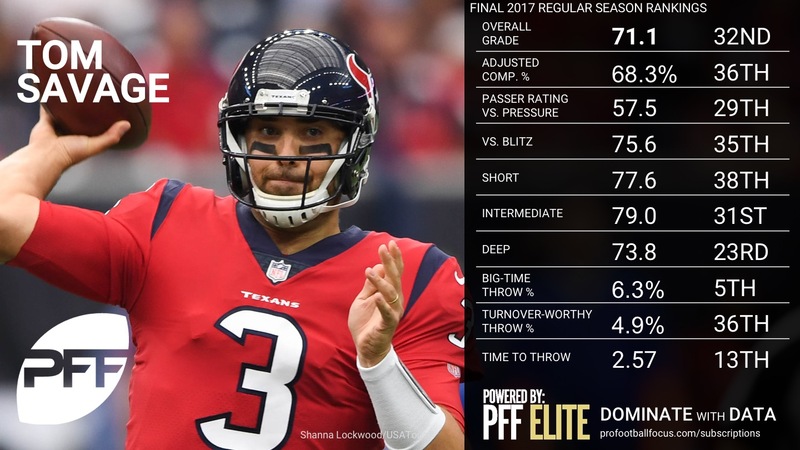 Overall for the season, Petty ended up with a PFF grade of just 43.8, which failed to qualify for overall rankings due to the number of total snaps played, but would have ranked higher than only Blaine Gabbert if it had. 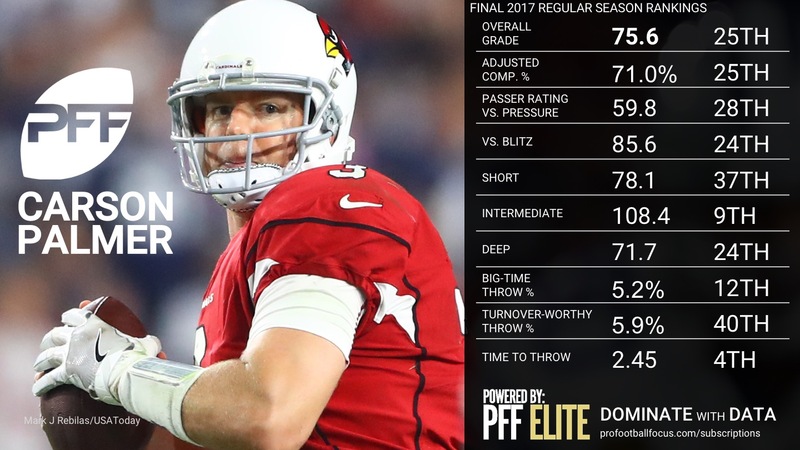 Excerpt from the PFF QB Annual: With starter Carson Palmer injured, the Arizona Cardinals were left to navigate more than half the season with Drew Stanton and Blaine Gabbert at quarterback. When Stanton got hurt too, the team turned to Gabbert and tried to talk up his chances, putting his prior years of bad play down to being on some bad football teams. 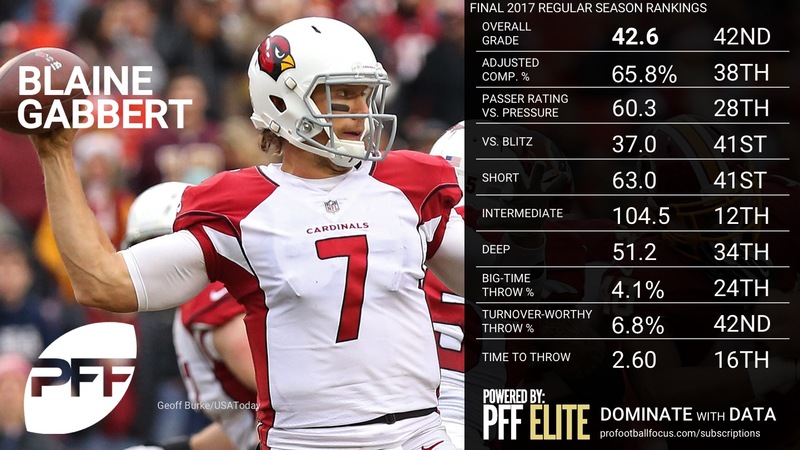 Gabbert then proceeded to put distance between himself and the rest of the worst quarterbacks in the league in the PFF grading, ending the year with an overall mark of just 42.6, cast adrift the tail-end of the rankings at No. 40 overall.